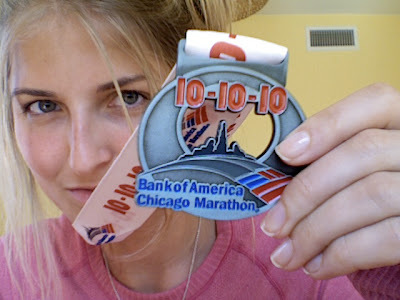 lilmissjen: The 2010 Bank of America Chicago Marathon: My wrap-up post. I think there def is a Tri in the future. Unless you're Paula Ratcliffe or Haile Gebrselassie there will always be people in front of you. Always. Congrats. You're part of the tiny fraction of people who have completed a marathon. Honestly, if it was a breeze, everyone would do it, huh? SO impressed, still. That's an incredible undertaking. I just awoke from my coma. It seems I have been in it since we finished the race some 15 days ago. The future is amazing - although I was hoping to see more jetpacks and foods in pill form. It'll take some time getting used to, but I'll get by. I had both legs amputated in a fit of post-marathon rage. I'm never running (or heisting) again.